Harris-Stowe State University is one of the most progressive campuses in the St. Louis area. In 1998, the University opened the AT&T Library and Technology Resource Center. This facility provides the technology and all the resources necessary for student and faculty research. It contains meeting facilities often used by community organizations. The Telecommunity Room comfortably seats 50 people and provides full streaming video access. The George H. Hyram Seminar Room is perfect for teleconferencing and virtual meetings and can comfortably seat 20 individuals. The computer lab is available for teaching and training with access to 17 computer stations, ideal for collaborative learning. The AT&T Library is an excellent place for students to relax or study and provides an open-access area that contains high-speed internet-connected client stations including our growing list of electronic databases, the Library catalog containing over 280,000 online books, and over 75,000 print titles. The new Social Justice and Policy Collection, containing the Frankie Freeman Civil Rights Collection, complements the previously existing Urban-Multicultural Collection. 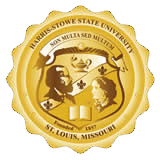 Harris-Stowe belongs to the MOBIUS Library Consortium, providing access to over 28 million items available from the 77 member academic, special, and public libraries serving users in Missouri, Oklahoma, Iowa, and Texas as well as a reciprocating borrowing agreement with the Colorado Alliance of Research Libraries. The Library staff offers workshops on library skills, as well as research and study skills for individual students as well as providing orientations and library skills presentations at the request of faculty. Named for the late Attorney Donald Wolff and his wife, Heide, who donated the initial collection from their vast, personal collection of jazz and blues recordings, and administered by the AT&T Library and Technology Resource Center, this archive of music of all genres in many historic recording formats is available for the patron’s listening pleasure. Currently also housing the Black Radio Hall of Fame, the Jazz Institute is an eclectic collection of music and books that pertain to the world of music and musicians. While primarily covering jazz, the music lover can find a little bit of everything here. The full collection is cataloged in the AT&T Library online catalog and included in the MOBIUS catalog. The Don and Heide Wolff Jazz Institute sponsors the monthly “Wing Fling” during lunch time, showcasing local jazz and R&B musicians and vocalists, as well as evening concerts with jazz and R&B talent from across the country. This archive is currently located on the ground floor of the Henry Givens Administration Building and open to the public.